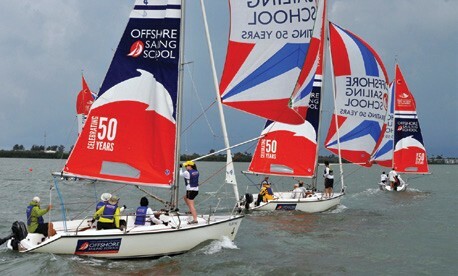 Our friends at Offshore Sailing School are commemorating their 50th Anniversary year with a celebrity pro-am regatta from January 8-10, 2015 in Ft. Myers Beach, FL. Presented by Merrill Lynch Wealth Management, this winter weekend of friendly competition on the warm waters of the Gulf of Mexico will benefit The Leukemia & Lymphoma Society. All sailing skill levels are invited to join celebrity skippers aboard Colgate 26s. Limited to just 36 participants, hosts Gary Jobson and Steve Colgate (who are among the nine celebrity skippers) invite you to bring your own crew or join others to race with sailors including Ed Baird, an America’s Cup winner and three-time Match Racing World Champion, and Dawn Riley, the first woman to manage an America’s Cup syndicate and the first American to sail in three America’s Cups and two Whitbread Round the World Races. The four-day/three-night Weekend Regatta Party Package includes three night’s resort accommodations at the Pink Shell Beach Resort & Marina, meals, parties, sailing with celebrity skippers, complimentary use of Colgate 26 and other fun surprises. Package prices start at $1,500 per person double occupancy and $1,880 single occupancy. A minimum of $500 of each sailor participant package goes to The Leukemia & Lymphoma Society. Call Offshore Sailing School at 800-221-4326 or visit OffshoreSailing.com to book your regatta package and help find cures for blood cancers!